Temporary pump stations are crucial when you need to move large volumes of water quickly and efficiently. At nearly half the cost, and requiring very little civil works, a temporary submersible pump station can be installed in a matter of hours when time is critical. These lift stations provide a solution to excessive rainfall, high tides, flooding, and other water-related emergencies, or simply when you need to move large volumes of water from one place to another such as when a traditional station must be bypassed due to maintenance, or you need to move water into a levee. 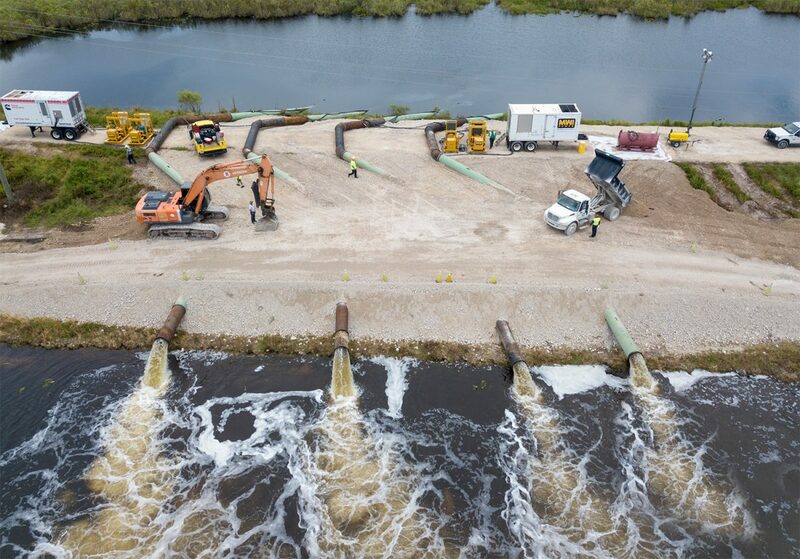 Conversely, temporary pump stations can provide the mitigating barriers necessary to prevent further water movements. No matter the situation, MWI Pumps are available for purchase or rental to suit your needs. During the wake of hurricanes or storm events, and when used alongside other water maintenance accessories such as aqua-fences, booms, bunds, and sandbags, temporary or mobile pump stations can be deployed to move water safely in order to prevent further damage to an area caused by flooding, standing water or erosion. When used as an alternative to a permanent or traditional pump station, temporary solutions are incredibly efficient and versatile in being able to be installed fast, with less labor and setup times, quick on-site repairs and no costly building of structures necessary. They can be used in tough or flooded environments due to remotely located power drive units, and mobile units can even be driven right up to the pumping site and ready in minutes. But how do you set up a temporary pumping station? How do I set up a temporary pump station? Be prepared if possible. Whether it’s preparing for Hurricane Season, planning for routine maintenance on an existing pump station, or there’s a known potential for an overabundance of water that needs to be moved, every municipality should have a water pumping plan in place. A plan could be as simple as purchasing a few mobile pumps for the occasional dewatering occurrence, or a pump rental and service agreement in place for the Hurricane Season so that every city and town can be prepared if/when needed. Make sure you have a place to pump it. Temporary pump stations can be set up anywhere with little or no original structures – where once there was nothing, a pump station can be erected in no time. However, water pumps can be deployed to move the water from point A to point B, but when emergency events happen and flood waters rise, there needs to be a place for the water to go. Ask yourself, where will I put the water? If an answer cannot be clearly defined, the waters may have to subside before dewatering pumps are effective. When in doubt, call our 24/7 emergency line at 772-770-0004 and let our team of professionals help to find a solution. Make sure you have the right pump for the right job. There are many different types of pumps with varying capacity, size, horsepower, etc. Additionally, every job is different, from the elevation you need to pump, to the distance, choosing the right pump can be difficult. When in doubt, ask our team of engineers who offer free guidance to help pick the equipment that is right for you. They will assess your individual situation and provide you with a custom plan that meets your needs. Where can I find temporary, mobile or traditional large-volume water pump services near me? The good news is the professional water pump services of MWI Pumps has the mixed flow pumps, axial flow pumps, and other industrial submersible, trash, bypass, mobile and dewatering pumps for sale or rental that you need to get the job done. To learn more about our industrial, large-volume water pumps, contact MWI Pumps today.